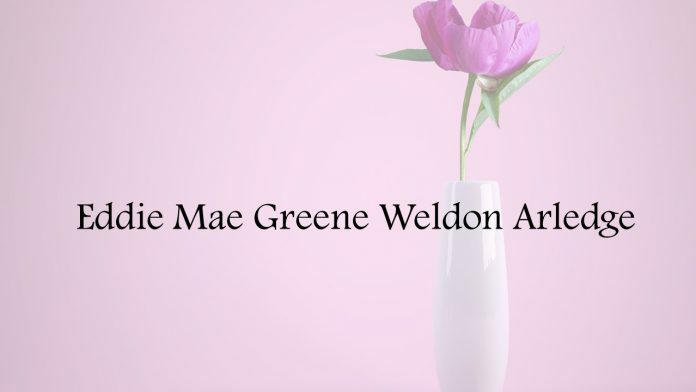 Funeral services Eddie Mae Greene Weldon Arledge, 89, of Hanceville will be at 11 a.m. Sunday, March 24, 2019 at the Hanceville Funeral Home chapel. Reverend Tim Barnett will be officiating. Visitation will be Saturday March 23, 2019 at 5:30 p.m. Burial will be at the Kendrick Cemetery, Shelby County, Alabama. Survivors include Eddie’s children; daughter Freida (Weldon) Burdette of Hayden, Alabama and son Ricky T. Weldon of Mobile, Alabama. Grandchildren include Lisa Welch and Angie Black. Great grandchildren are Christian Welch, Ashton Jax Kruz Loria, Allison Weldon, Emily Carter, Carolyn Black and Carrie Black. Eddie is preceded in death by her granddaughter Stacey Carter.